I want more good leads, more motivated sellers... More saleable listings and more commissions! Try the Mind Matrix Plus system for full 2 months. If you’re not getting more leads and listings, simply let us know and we will happily refund your entire purchase. No questions. No hassle. 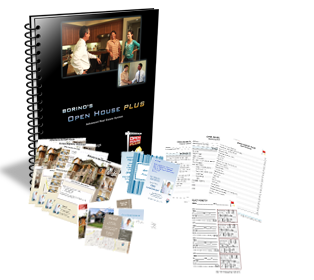 Complete course with tools, tips and tricks you’ll need to make open house work and end up with plenty of leads. A live demonstration of how to turn your visitors into a leads and a customers quickly with “No Pressure” scripts and friendly dialogs. Open house flyers, invitations, mailings, postcards… Plus a guest register too keep track of your visitors and turn them into leads. Free 30-day trial membership to the Listing University with full access to advanced marketing tips, coaching, and systems that generate quality leads and listings quickly. Find out what’s working right now.